Welcome back! I took a week to go do things that weren’t Magic, but now I’m back and wishing I weren’t. Why? Well bear with me. No, Watery Grave isn’t what I’m annoyed about. Rather, Watery Grave is an excellent card to keep an eye on because of the rise of various Modern decks which all use Blue and Black. 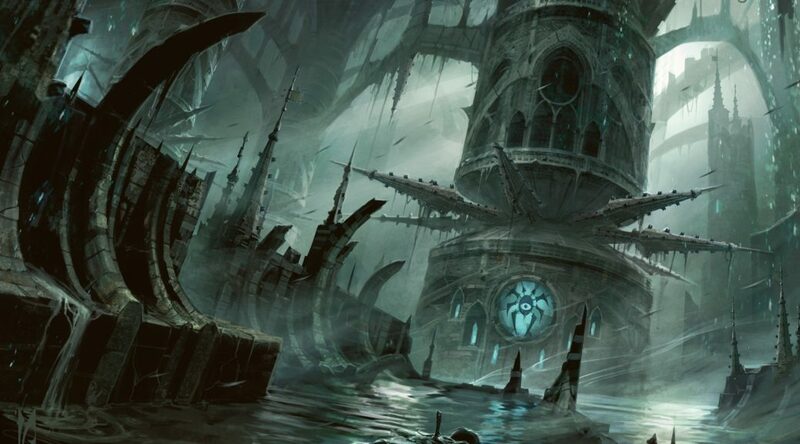 Among them are Death’s Shadow, Grixis Control, Reanimator, Sultai Control, etc. None of these play a staggering amount of the card, but added up they create a healthy pocket of demand, and most importantly, supply is drying up. There’s a handful of $11 copies on TCG Player right now, and then some at $12 and $13, but it only takes a couple of playsets before we hit $15-$20. Checking major vendors, there’s even fewer copies below $20, where they’re even in stock. Anecdotally, after turning my TCGPlayer inventory back on after my vacation, I sold every copy I had overnight, after they had sat stagnant for months. With the Zendikar fetchlands in Modern Masters 3, prices on Modern manabases are continuing to fall. In light of that, it may finally be time for shocks to begin rising, and it looks like we’re starting with Watery Grave. Of course, how many times have we heard that before? Friday’s Amonkhet spoiler gave us reason to pay close attention again. We saw what everyone immediately decided should be called bicycle lands. 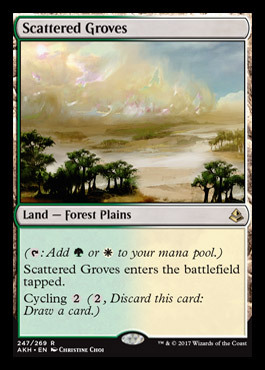 These are the first lands with cycling to hit Modern. Every land with cycling so far hails from Urza’s Saga, Onslaught, or the Commander product. With the bicycle lands, there’s suddenly cycling lands to play with Knight of the Reliquary. These aren’t just cycling lands either; they’re quite solid. They cycle, they make two colors of mana, and they’re typed, which means you can fetch them. They always enter tapped, which is unfortunate, and likely to keep them from tier one status, but any mono or dual-colored deck is going to at least think about these. Additionally, they potentially signal the Onslaught cycle lands showing up as a common or uncommon cycle in Amonkhet. Will they? We have no idea. But once we’ve got these five, five more at common aren’t inconceivable. Supply on Knight of the Reliquary is reasonably high right now, with prices around the $8 range. If the bicycle lands have a strong showing in Modern, that could change real fast. With a bicycle Knight deck (heh) cleaning up at the top tables, we could see her double quickly, with absurd prices possible if the deck sustains. Here’s what I’m agitated about. Twenty minutes ago, a Wizards account made an unassuming post in a Magic subreddit. Never mind the fact that I’ve got over 100 Beck//Call and half as many Breaking//Entering, which are now 100% useless because of this announcement. What’s especially irritating about this is that they’ve effectively banned 10 or so cards, on a random Monday evening on Reddit. It’s not like they hit any tier one decks or anything, but it’s still bad precedent. This of course renders all the split cards, such as Beck//Call, Breaking//Entering, and Boom//Bust irrelevant. The recent Expertise cycle in Aether Revolt is considerably less interesting now. Brain in a Jar has lost potency. Free spells are still safe for now, such as Restore Balance and Ancestral Vision. For Now. Yes, the stealth banning pissed me off. Brain in a Jar foils, sitting on my shelf… literally useless right now. A stack of Beck // Call are also the same thing. It’s timely because I have a nonfoil Breaking // Entering sitting on my desk from when I was picking a collection. I left that one card sitting on the desk overnight, came back the next day after work and the 3 year old had done a number on it. It’s now wrinkled, missing an edge, etc. That is our only hope at this point.